​​Hollie was born to a musically talented Mother, who played piano and sang live on her own radio show and with a brother who played guitar and sang professionally since age 15 and brought her into his band as her first professional experience. By age 18 she was working full time as a professional keyboard player and lead singer/songwriter. 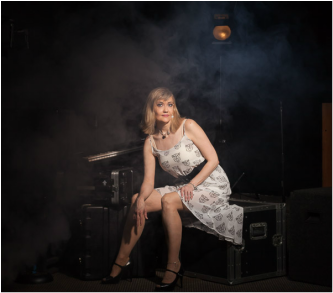 Throughout her 30+ years in the music business she performed throughout 11 western states and Alaska working with a variety of acts from solo piano/vocals to full bands. As a true "on the road" musician playing 300 dates a year, she made her sole-living working in many styles of bands and acts. This crazy life lead her to write her humorous memoir: I’m Not a Groupie! I’m IN the Band! Which can be purchased at online retailers everywhere. Click HERE to purchase. (Free on some digital services like Kindle Prime). ​Hollie is fortunate to have a solid circle of professional musicians supporting her, both locally and around the world taking advantage of the digital studio and online age where sharing tracks through the internet allows a high level of production not found in the past. Hollie's primary focus is writing and performing all original music. She is a Singer/Songwriter who mixes in her love of Blues. Although, not one to be kept in a box, she has many other genre's of music she releases as well. In 2019 she will be launching a live act to play her originals as well as choice cover songs and be back in front of an audience wherever that gig may land in her local area. Hollie is part of Kompoz, an online community of musicians where they use their own recording studios to provide tracks for each others originals music. Here is a sample of Hollie playing piano and/or organ on different styles of music.